Click here to read my thoughts on the movie. 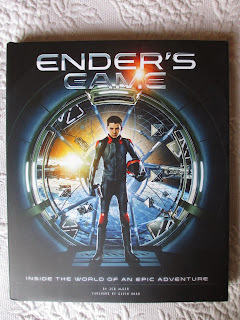 In my voracious appetite for movie books, I quickly acquired the companion book for Ender's Game after seeing the movie. Going through Jed Alger's Ender's Game: Inside the World of an Epic Adventure reminded me of my early days delving into movie companions. This was back before I was willing or able to go see a movie more than once in theaters, so sifting through the companion book was a way of reliving the movie experience. While average movie companions are slim, paperback beings, this volume is hefty and hardcover. That's all good and well, but it does come with a higher price tag. It's hard, though, to complain when you hold this book in your hands. The design of it is almost seamless. There are movie stills, behind the scenes pictures, and a large amount of concept art; the images are all arranged well with the text so that you can read page by page without having to flip back and forth. The text is also arranged in small enough sections that you can move easily through it. As the book advertises, it has two little fold-out posters, an I.D. badge, and stickers with the team/army logos. Although all that made me feel like I was twelve years old (who ever said this was a children's book or movie? ), I was tempted to peel off those stickers--but don't worry, I kept them safely unused for preservation purposes. The content of this book deals primarily with the themes, settings, imagery, and overall look of the film. This includes things like the sets, the uniforms, the battle rooms, and various props. Unlike some companions, it isn't heavy on what it was like to be on set; it's more about the craftsmanship, whether physical or digital, involved and the philosophy behind this work. In describing everyone's interpretations of things in the book, there ends up being quite a bit of talk about plot. It all starts to get a little too plot heavy (most people reading this companion will have already watched the movie and read the book it's based on). However, Alger doesn't simply retell the plot; he is providing interpretations of it. And since this is a book for which you can form many interpretations, this plot-heavy approach does make a certain sense. I mean, I've come to love this story enough that I don't mind reading more about it. But for me, the real value in this book is in the images it provides (particularly the concept art and the images of sets, things being built, or mechanisms that were used) and the quotes from the cast and crew (these are all woven straight into the text instead of being isolated). This book was well worth reliving the movie and learning more about how this story was brought to a new medium, the screen.